Yesterday, we carried news of fifteen year old Berkin Elvan’s death. He weighed less than 36 pounds at the time of his death. In Turkey and in cities throughout the world protests have been held in mourning and in anger. 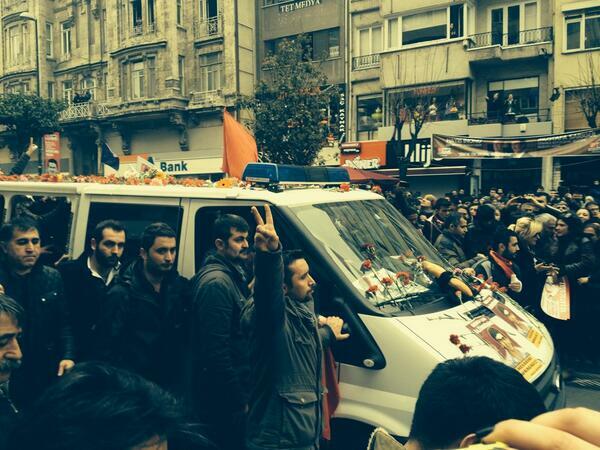 In Istanbul, thousands converged to participate on his funeral procession. President Abdullah Gul expressed his sadness and appealed for calm, urging everyone “to do everything to prevent this from happening again”. Vice Prime Minister, Bulent Arinc is quoted as stating that “Turkey is in mourning” due to Berkin’s death. In the nine months that have passed [since Berkin was first injured], the police officers responsible for firing the tear gas canister have not been identified. The protracted and ineffective investigation into his case is typical of those opened following allegations of police abuses during the weeks of Gezi Park protests. In response to the thousands of complaints only two criminal prosecutions have been opened against police officers. Unfortunately, there is very little evidence that Turkish officials are getting the message. Investigations are not being carried out with any urgency and, with Turkey’s culture of impunity intact, the police are free to continue abuses. According to press reports, two protestors were injured in the town of Mersin when they were struck by a armoured water cannon vehicle (TOMA), while at Middle East Technical University, in Ankara, police used tear gas and water cannon, and some students were beaten with truncheons. Access to Gezi Park is, once again, restricted. Even as I write this, Andrew Gardner’s twitter feed reports that the police are using tear gas against crowds following Berkin’s funeral. This entry was posted in Amnesty International, Excessive Force, Freedom of Assembly, Freedom of Association, Freedom of Expression, Turkey and tagged #BerkinElvan, Abdullah Gul, Amnesty, Amnesty International, Andrew Gardner, Berkin Elvan, Diren Gezi, DirenBerkin, DirenGezi, excessive force, Freedom of Assembly, Freedom of Expression, gas canisters, Gezi Park, Human Rights, impunity, Istanbul, protests, taksim square, tear gas, water cannon. Bookmark the permalink.